180° PANORAMIC VIEW DESIGN-Breakage-proof safety window with 180° wide viewing allow you to see more fish and sea creatures than ever before,and it is the biggest of any snorkel mask on the market today. ANTI-FOGGING DESIGN-Separate Inhaling and exhaling channels effectively prevent fogging. 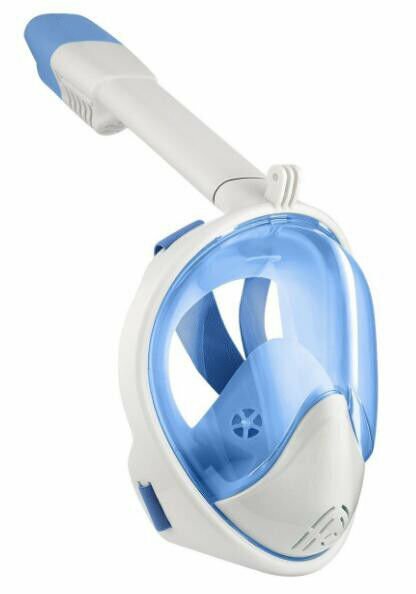 DRY TOP TECHNOLOGY-The snorkel mask is equipped a floating ball which will seal the top of the snorkel when submerged, prevents salt water from getting into your mouth or nose. BREATH NORMALLY-Full-face snorkeling mask for you to breath naturally through the nose and mouth. 3) OEM & ODM are welcomed.